After 001, the numbers represent the order in which I photographed the bridges. 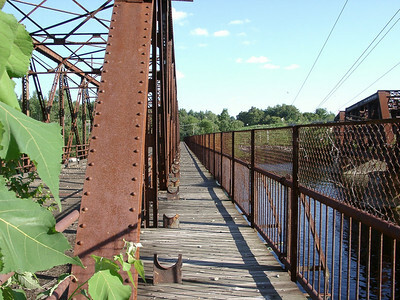 This bridge is the last surviving 3-span High Pratt steel truss in New Hampshire. 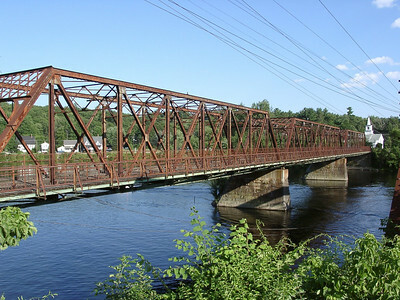 It used to carry Main Street over the Merrimack River; this connected U.S. Route 3 to NH Route 3-A. 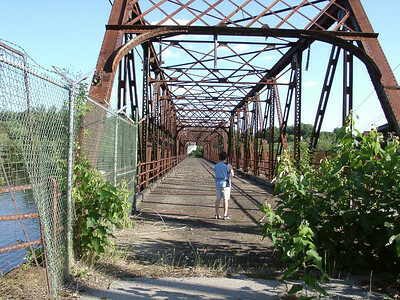 It was built in 1909 and one of the spans was rebuilt in 1936. 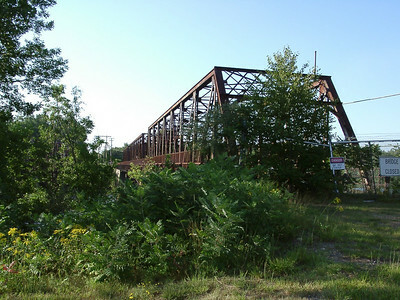 The current Main Street bridge was built nearby in 1976. For more information, click here. These photos were taken on August 3 and 4, 2002, with a Casio 3.3 megapixel camera. 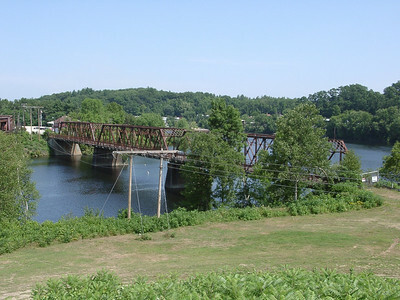 Looking south over the Merrimack. 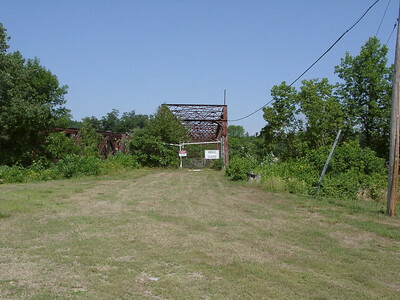 The steel structure you see at far right is an adjacent railroad bridge. Peter is not daunted by signs or fences. This is the north end of the bridge. Although no longer usable as a pedestrian crossing, the deck does not look bad from here. The signs that once hung here probably warned of load restrictions. This bridge was built to accomodate pedestrians along with traffic. It appears to have also carried a pipe. The railings are in decent shape and had somewhat fancy posts. 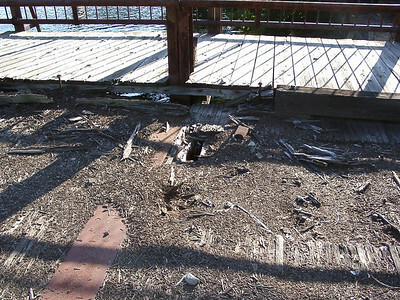 Closer inspection of the deck suggests why the bridge is fenced off. 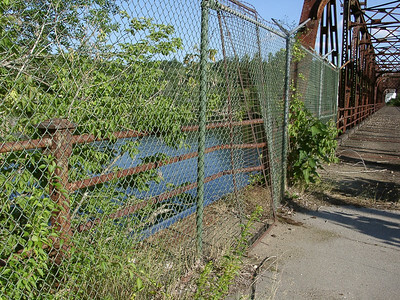 The rusted fencing suggests that the bridge was converted to pedestrian use for a while after the replacement bridge was built. 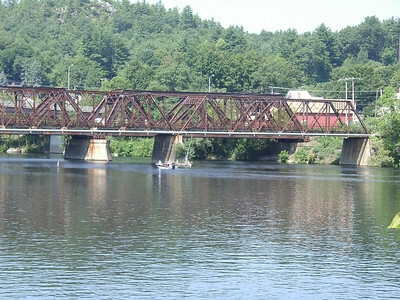 Looking downstream along this westerly-flowing section of the Merrimack. The massive railroad truss makes the Lilac bridge look more frail. The approach to the bridge from the north. Not much of the original Main Street remains. 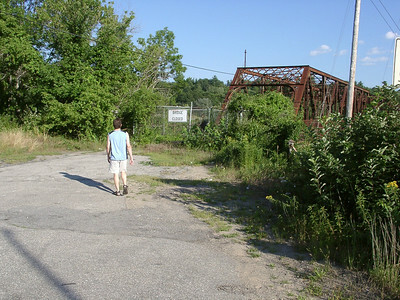 The Lilac Bridge as seen from Main Street, on the approach to the current, much higher bridge.